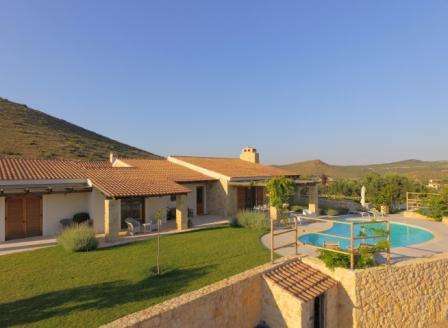 Cotes des Oliviers is a magnificent private villa located beside the Sounion National Park, close to the town of Anavyssos and the Temple of Poseidon in the Attica region of Greece. This villa for sale in Greece is set on an elevated site of 8,500 sq m with 180 degree uninterrupted views over the rolling countryside, hills, vineyards, olive groves and pencil cypresses, reminiscent of Tuscany. This luxury property is 8 kms from the beach, in a tranquil location away from the noise of Athens, which is only 55 kms away. It is built in French style with extensive use of natural materials including stone walls and floors, solid chestnut beams, distressed chestnut doors and a huge stone fireplace creating a rustic, chic ambience. The land and gardens are accessed by double entrance gates opening onto a cobbled drive with a parking area for over 10 vehicles. The property comprises a main, 3 bedroom villa with study that could be transformed into another bedroom and, on the lower floor a self-contained one bedroom apartment. There is also an open internal courtyard and a private swimming pool. The villa has 405 sq m of living space with an entrance hall that has a coat closet and a guest bathroom, a large lounge with a large open fireplace and feature stone wall, a dining room that can seat 8-10 people and a kitchen fitted with Chalon distressed kitchen furniture. There is also a pantry and a utility room with washing machine and dryer. 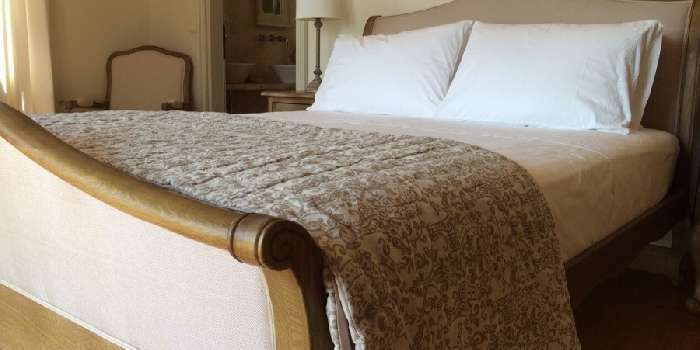 A corridor leads to the master bedroom that has a walk-in dressing room and an en-suite bathroom and there are 2 further double bedrooms both with en-suite bathrooms and one with access to a large terrace overlooking an olive grove. Most rooms have beamed ceilings and there are stone floors throughout with oak floors in the bedrooms. All bathrooms are fully tiled with Travertine limestone. A staircase leads down to the apartment where there is a sitting room, fully fitted kitchen, one double bedroom with en-suite bathroom. Also on this floor is a freezer room, a wine cellar, a large store room, workshop and a boiler room with Viessmann central heating boiler and 2,300 litre diesel tank. The property features French crystal chandeliers, underfloor heating, ducted air conditioning, double glazed windows with mosquito nets, smoke alarms, burglar alarm and wireless internet. The lounge, dining room, kitchen, study and master bedroom are all south facing with fabulous views. The lower ground floor opens onto a west facing lawn area. The villa is set on a large 8,500 sq m plot of land with a double garage with direct access to the house and remote control opening, and an outdoor shed that can be used as a second garage for one car. Landscape gardens surround the villa with over 500 sq m of manicured lawns and borders of lavender, bougainvillea, jasmine, wisteria and scented roses with an automatic watering system. The gardens feature a kidney shaped swimming pool with salt chlorination, an outdoor shower and outdoor ambient lighting. There are large sunbathing terraces, an outdoor dining pergola and a barbecue terrace. Also on the grounds is a large kennel for 4 dogs, a fenced organic vegetable garden, a 5,000 sq m fenced off paddock on a south facing slope that would make a fabulous vineyard and over 80 trees, many of which are olives and produce enough olive oil to be self-sufficient. This luxury Mediterranean style villa is in an extremely peaceful area with no through traffic and the nearest house is over 80 m away. A perfect place to buy a magnificent villa with a private apartment in Greece for personal use or holiday rental purposes! !